Download a free digital catalog that showcases the West Coast of British Columbia, Canada, and the coastal vacations and ocean adventures offered by BC's West Coast tourism businesses. From sandy beaches to rugged coastlines, ancient rainforests to deep fjords, your coastal vacation will include breathtaking scenery and a wealth of marine life and forest creatures. Full colour catalog listings include images, vacation information, contact info, website links and e-mail addresses for West Coast resorts, lodges, and tour operators. BC's West Coast accommodations range from full service luxury resorts to secluded saltwater and salmon fishing lodges, spa resorts, cottages and wilderness camps. Guided tours and charters offer whale watching, marine excursions, grizzly bear viewing and guided expeditions to view the Kermode bear, BC's famous Spirit Bear in the Great bear Rainforest. Explore Canada's West Coast by sea kayak or charter boat. Discover the wide variety of marine life that inhabits the coastal waters. Enjoy whale watching, eagles, bears and marine life. Try your hand at some of the finest salmon, halibut & bottom fish sportfishing in the world and witness BC's ancient rainforest and it's wildlife. And at the end of the day, relax in a soothing hot tub or natural hot spring. 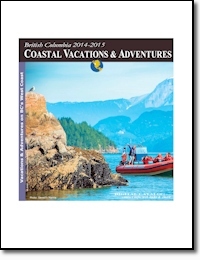 British Columbia Coastal Vacations & Adventures Catalog includes West Coast family vacations, saltwater oceanfront resorts, salmon fishing lodges, wildlife viewing, wilderness adventures, whale watching, tours, charters, guides, rentals, cruising, fishing, ocean kayaking, and more! BC Coast Vacations Guide - A part of the BC Adventure Network. BC's largest travel network.